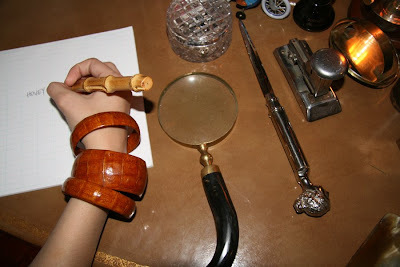 The great ebay seller Acerna-02, which led me to my beautiful croc clutch, is now selling bangles and cuffs, as well! They only put up a couple bracelets at a time, but consistently replenish their stock. I picked up these for about $23 for the pair of small bangles and $23 for the single large cuff. Simply beautiful! It's amazing how the bangles and the desk are a perfect match . . . or kind of sick! It is always cool to have an up to date wardrobe and if it is under budget – then it is even cooler. Do your research about the shops and you will be blessed with all the variety and quality you could ever imagine. It is natural to go for used clothes and accessories to save money. But it is also an ethical consumption as it is a low carbon purchase. So lean towards buying clothes in the off season. It will be friendlier to both the environment and your pocket book.